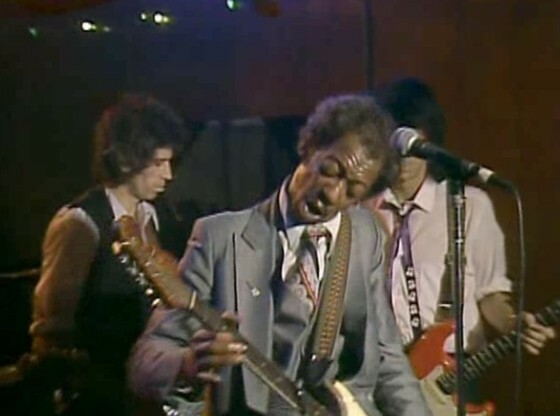 The release late in 2012 of the DVD “Muddy Waters & The Rolling Stones Checkerboard Lounge 1981” once again brings to my mind the strange relationship between blues and rock ‘n’ roll. This show occurs almost four decades after Muddy’s days on the plantations in Mississippi, but the power of that musical heritage is only enhanced by his maturity and elder statesman status in the world the blues. During Muddy’s third song, there’s a shot of the Rolling Stones entering the club and then one of their being seated at a table in front of the stage. Muddy invites them to “take your time” and have a drink, and then calls out for Mick Jagger to join him. Jagger, either coy or genuinely anxious about joining Muddy, needs a few requests from the master before he gets up with him. Soon Muddy says “What about Keith?” and Keith Richards and later Ron Wood also get up on stage, both furiously puffing cigarettes while playing guitar, the cigarettes never leaving their mouths, almost as if they were fig leaves in post-fall Blues Eden. They are kind of a comical duo to be sure (I wonder how they get any actual oxygen to breathe as well!). What goes through the mind of the great blues master hosting the world’s biggest active rock band on a nightclub stage in Chicago? The Stones, like many other rockers, at times seemed to worship at the altar of these blues masters, yet the rockers are always the real stars, and the reverence often has its lapses – – as when The Stones initially took credit for “Prodigal Son,” later correcting it to indicate authorship by Rev. Robert Wilkins. It’s definitely a two-sided coin. The influence of the rock musicians did make blues known for wider audience, but the blues artists are ultimately always in a subordinate position, and for true blues lovers, whose love of blues transcends the fact that it is the major ingredient in rock, the whole thing can be a bit grating. Muddy and Mick sing “Hoochie Coochie Man” together, and when Mick sings the line, “I was born for good luck,” Muddy replies, “I see that!” It’s hard not to see this exchange in a broader context than just the song. 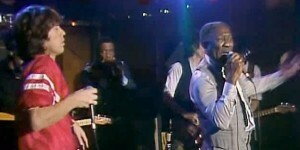 Muddy calls out for Buddy Guy, who joins the group on stage repeatedly embracing Jagger. 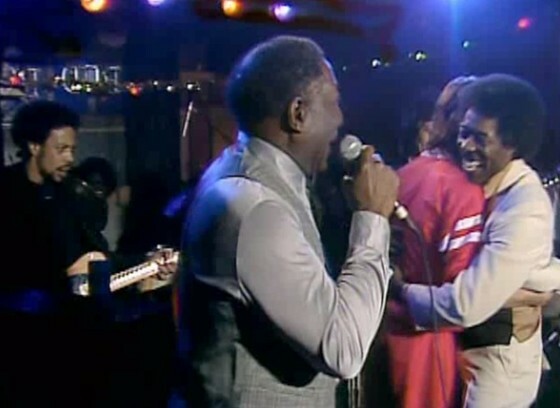 Muddy also calls for Junior Wells, who embraces Muddy and seems largely unaware of Jagger. Perhaps I’m reading too much into this, but some deep blues fans have been troubled by Buddy’s relationship with the rockers, how he seems to defer to Eric Clapton, and appears to get on board with each ephemeral rock phenom that comes along. To be sure, Buddy has talked about how some of the greats of Chicago blues didn’t get what they should get, and he was determined that would not be his situation. Junior seemed less interested in courting the rockers. Unfortunately, too many very talented blues artists never did benefit from recognition in the rock world. Lefty Dizz joins the band at one point, a great left-handed guitarist and singer who leads things for a while while Muddy and Mick sit out, and is certainly more fun to watch than the “cigarette twins” (except when Keith’s long ash finally falls from his cigarette while he’s playing). Lefty is one of the many artists that only the true blues lovers got to know and appreciate. Mick, sitting at a table, definitely appreciates him, but rock ‘n roll, while it did advance the career of Muddy Waters, did little for Lefty Dizz and most other Chicago blues players. 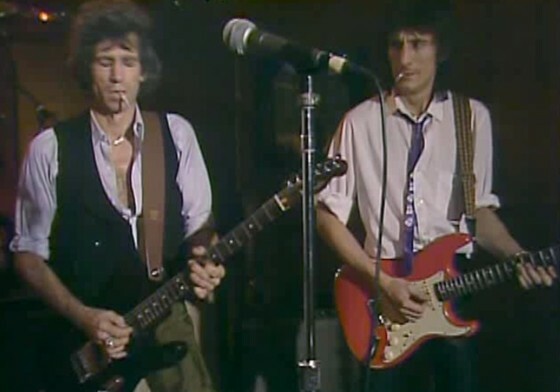 Muddy and Mick are both shown responding approvingly to Lefty’s politically incorrect song “Ugly Woman.” Both come back at the end for a few more songs, with plenty of guitar support, from John Primer, Keith Richards, and Ron Wood. Primer’s appearance on this DVD is especially welcome. His playing is great, and there is a bonus cut where he sings lead. He is still active today with a new album “Blues On Solid Ground,” issued last year. As a “blues lover first” I may view this DVD somewhat differently from a rock-oriented viewer. I’m especially excited By Primer and Lefty Dizz, who are not publicized in the title of the disc, and Muddy remains transcendent for sure. The Stones are more interesting as a cultural phenomenon than as blues players. To my thinking, the Stones’ greatness lies not in what they do with blues, but in their own songs, which clearly incorporate their knowledge of the blues, but are really a different sort of music. This DVD certainly contains some great performances and some moments of fun, but it is also a reminder of just who stands where in the music world, and how blues artists and blues music played a crucial role in popular music while ultimately never quite rising above a “best supporting” role themselves.